Truthful Tidbits - Bits and Pieces of My Life: Yay!...The Grace Card Movie... Is Out On DVD! 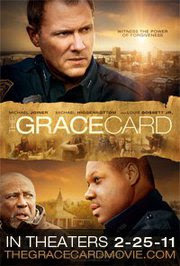 Yay!...The Grace Card Movie... Is Out On DVD! "Never underestimate the power of grace!" You can link up your memories by clicking on the button above....@ Get Joy! Tell us a memory...either from long ago, or last week! Mine is a memory from the first of this year when we went to see The Grace Card movie. It was such a good movie, that we all walked out of the theater feeling blessed and challenged to live like Jesus...and to love others, the way that Jesus loves us. It was like we had seen His love in action...lived out right there in front of our eyes! Yes...we were blessed to preview this movie, and it was so good, we highly recommended it at the time, and told everyone they should go and see it when it came out to the theaters last February. Many of you may have seen it...but if not, I just wanted to mention it is now out on DVD and on sale at Wal-Mart, and other stores. Yay!!! It is a life changing story. It makes you want to bestow forgiveness and grace to others... in the same way that God does that for us. I intend to buy my copy and an extra one to lend to others, as a ministry tool. I hope you will too. I haven't seen this movie, but will keep it in mind. I never seem to tire of seeing a good movie. Got a haircut tonite at the mall....can't wait to wash the product out. I'm just not into this sticky stuff. Sounds wonderful ~ Def check it out. I haven't had a chance to watch mine yet, but I'm looking forward to it! I'm gonna have to have hubby get it! Linda~ Haven't seen it but I sooo want to! Thank you for visiting me today. I hope the Benedryl didn't knock you out. I'd have been down for the count with one swallow!